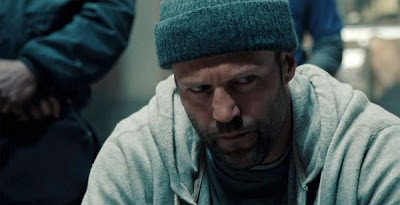 Synopsis: Luke Wright (Statham) is a mixed-martial arts fighter who gets on the wrong side of the Russian mob when he doesn't take the fall in a big fight. One day, after being forced into exile by the mob, Wright decides to help a little girl who is being chased in the subway. Doing so, he unwittingly gets himself mixed up with the Chinese mob, the Russians again, and a group of dirty cops. Fist fights and gun battles ensue! Andrew: Hello readers! Last night Sarah and I made it to the local multiplex to catch a mid-week movie, and we decided to see the new Jason Statham action flick Safe . Now Sarah, I know you're not a huge fan of Mr. Statham, so what did you think of his latest showcase? Sarah: It's true, I'm not a big fan. BUT, I will have to say that this movie pleasantly surprised me. I’m wondering if it's how I went into the movie completely expecting it to be crap. In the end, it was quite entertaining and actually a pretty good action flick. What did you think about it? A: Really?! I'm glad you liked it! I, too, was pleasantly surprised - but probably for different reasons. I was absolutely expecting lots of a fist-fights and cool action moves, shoot outs and funny one-liners (and we got those in DROVES, people), but I was NOT expecting the film to actually get me engrossed in the reasons WHY the film's plot happens. 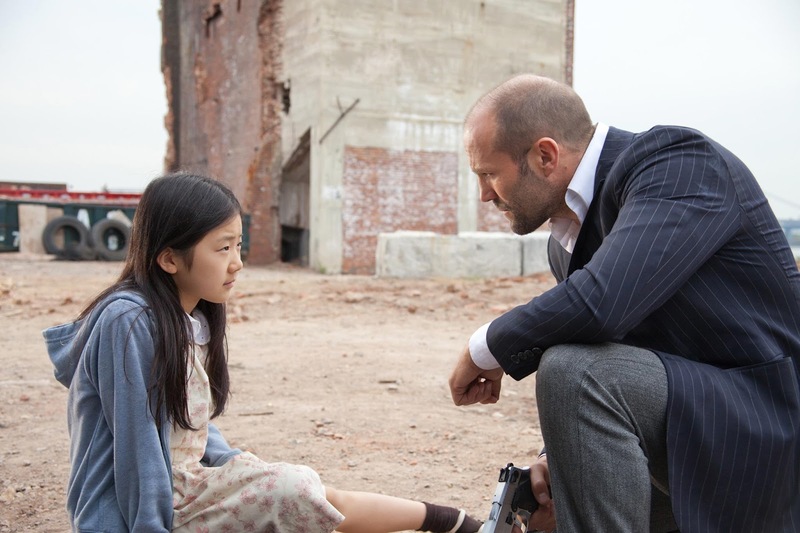 I mean, in the film’s first half hour Statham’s character, Luke, and the little girl, Mei (played fairly well by young Catherine Chan), don’t even cross paths. I liked that all the time is spent giving you the backstory as to why Luke is a homeless former mixed-martial arts fighter, and why Mei is in the predicament she’s in. 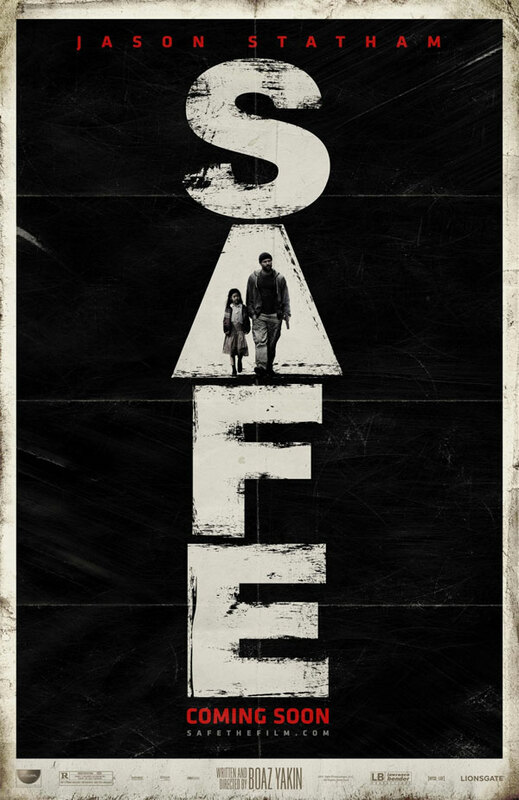 If it weren’t for the set-up and making me more invested in the characters, Safe would have been nothing more than a retread of every other nameless action flick. S: I will say that it is a lot like Statham's other movies, so I don’t think it’s a great movie. But all the dirty cops, drug lord Asians and gangster Russians made the movie a little more entertaining. Actually, the young girl who plays Mei was pretty good for this being her first movie. A: Yeah, there are a lot of things going on in this movie and again, the first half hour of the film sets it up. You have the Chinese mafia abducting Mei, you have the Russian mafia trying to steal her from the Chinese, the police come in to play and their history with Luke, and more. It might seem like a lot of players (and it is) but the film does a good job spelling it out in a way where I didn’t get lost at all. Kudos there. If there’s one knock I have on Safe, it’s that the climax was way too short for my liking. There was a lot of build-up and the payoff wasn’t great. S: See to me, the climax didn’t quite stand out amongst all the other action. There was SO MUCH action in the film, and they left almost none of it for the end. I felt there should have been some sort of differentiation from the rest of the movie and there really wasn’t any. A: Very true, plus the fact that in the end, the big villain in the film is someone who’s introduced about half-way through, he’s in maybe three or four scenes, and in the end he doesn’t get his comeuppance. S: I agree with you on that. The set-up was good and entertaining but the pay-off was lacking. Still, it's a fun action movie and if you are a big Jason Statham fan then you should see it in theatres, otherwise, Netflix it!